Being Vegan in rural North Carolina is hard. 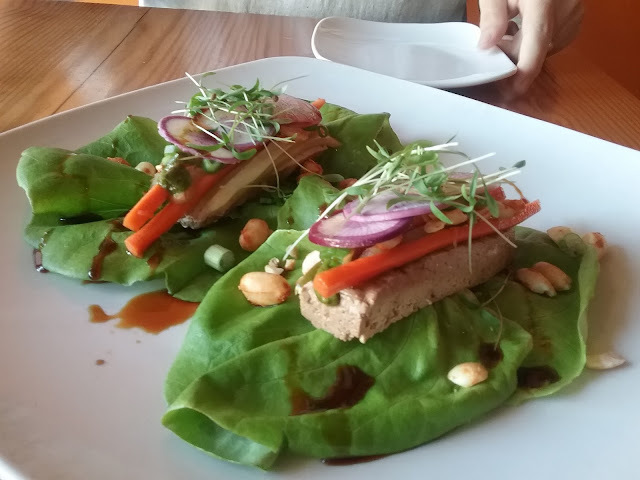 Most of our meals out on the town consist of salad with the occasional Pad Thai dish. We have managed to get some pretty good meals from Ruby Tuesday with their new Vegan menu, but for the most part, it is actually just their vegetable side dishes on one plate. Nothing really created with the intention of being a completely vegan meal. Recently hubby and I found our way to Fiction Kitchen. 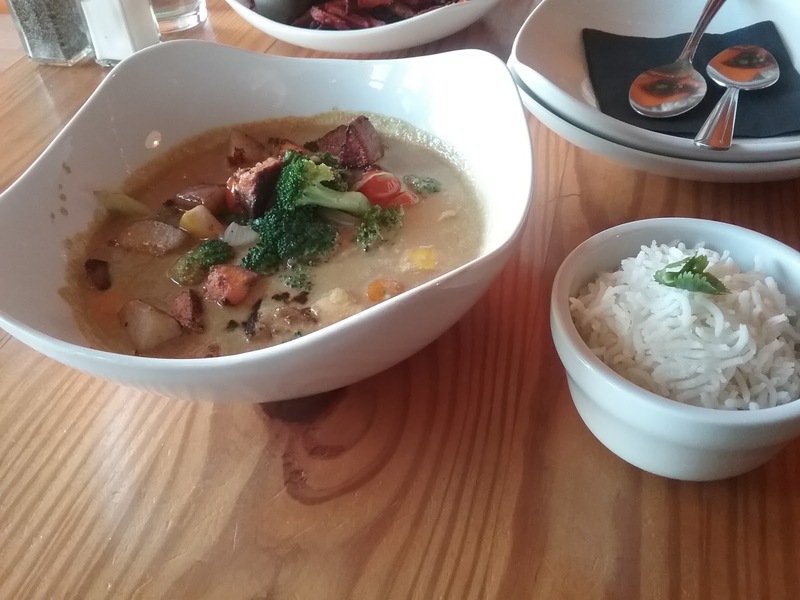 Fiction Kitchen is a little place in downtown Raleigh (about an hour and a half from us) that is really amazing. They offer a complete Vegan/Vegetarian menu. We finally managed to get over to their area at a reasonable time to stop in for dinner, and it was amazing. I'm going to give you a run down on what we had. We wanted to try a variety of things so that we could get a good idea of what we could expect. We started out with the Butterhead Lettuce Cups. I'm not a huge spicy fan but we tried them anyway. Here's how they arrived. Absolutely beautiful food. I didn't even pull the onions out like I normally do. I just picked it up and ate it. It was really good. Those microgreens on the top certainly packed a punch, too. When I read "radish" in the description I was a bit worried. I'm not a big radish fan. These however were really good. They didn't taste anything like any radish I had ever had. Really a fantastic dish. Next we ordered an entree and a side. For the entree we selected the Curry Bowl. This is how it arrived. Both hubby and I love curry so this was a safe dish for us to try. The curry was fantastic. We asked the server about the spice level and settled on a 2. This was spicy for me. If I were to reorder this, I would probably back it down to 1 but for someone who likes heat 4 is probably the best selection. I couldn't imagine it any higher. Over all a really good dish. It had these tiny tomatoes in the curry that burst open when you bite into them. It added a much needed cooling element to the dish. Nothing one note about this dish either. All the veg still maintained their independent flavor but were married together nicely in a right curry. We both really enjoyed it. 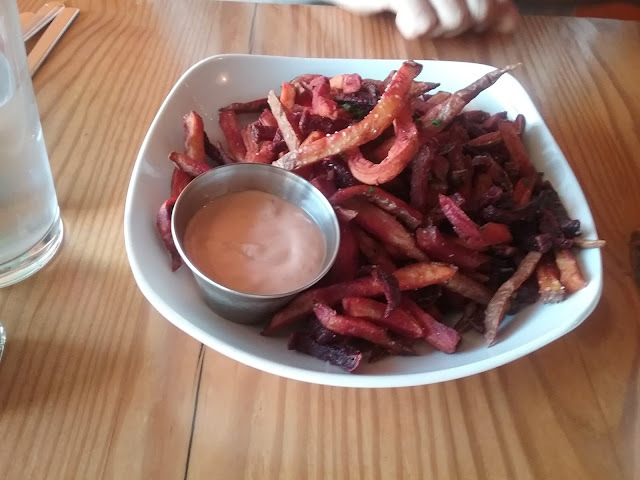 For an additional side we ordered the Root Vegetable Fries. We passed on the gravy and went with the chipolte buttermilk dressing. These are absolutely the best fries I have ever had in my entire life. I cannot begin to sing the praises of this dish. The server told us that this dish includes golden beets, potatoes and other assorted root vegetables. The fries alone were amazing but when added to that lovely dressing they were simply amazing. When I need a french fry fix, Fiction Kitchens' Root Vegetable Fries are going to be on my list! 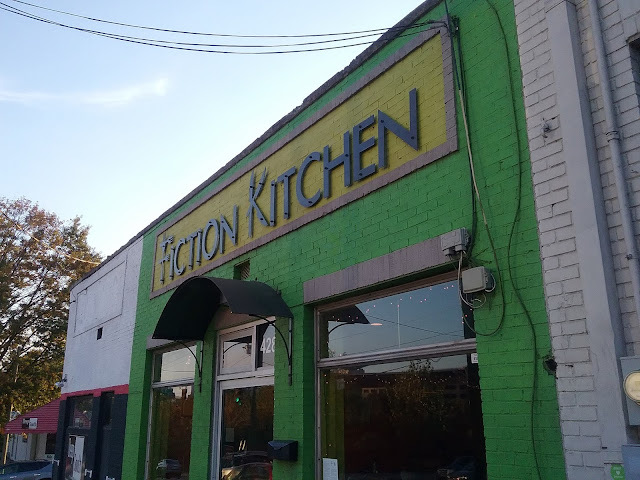 Fiction Kitchen is located in Raleigh NC and offers dinner and a weekend brunch. Be sure to head over to their website to check out their amazing menu as well as their facebook page. Note: I tried their website using Firefox and had some issues. I recommend using IE for the best browsing experience.